Breakfast is an important way to start your child’s busy day. Many studies have proven that regular breakfast-skippers lack nutritional intake throughout the day. Furthermore, skipping breakfast can trigger poor behavior. Children who enjoy the benefits of eating breakfast are likely to be more focused, less anxious, calm, and able to learn more effectively. In addition, breakfast sets a routine for kids and starts their day off in an organized manner. Breakfast is a key component for growing bodies and developing brains. In fact, the benefits of eating breakfast are greater than allowing your kids to sleep in a few extra minutes. Making a healthy breakfast is not a time consuming commitment – it can be as easy as pouring milk and cereal in a bowl. If making time to make breakfast in the morning is a real issue for your family, look into enrolling your child in a school breakfast program, or pack a brown bag breakfast your child can eat on the way to school in the morning. Better school performance: Breakfast eaters are more likely to achieve higher grades, pay closer attention, participate more in class discussions, and manage more complex academic problems than breakfast skippers. Better behavior: Some children are more vulnerable to the effects of missing breakfast than others. The effects on behavior and learning as a result of missing breakfast or eating a breakfast that is not very nutritious vary from child to child. 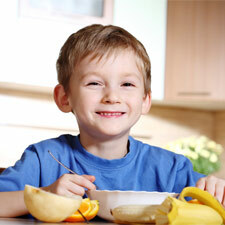 Increased brain function: What children eat for breakfast affects their learning. Children who eat a breakfast containing both complex carbohydrates and proteins in equivalent amounts of calories tend to show better learning and performance than children who eat primarily a high protein or a high carbohydrate breakfast. Breakfasts high in carbohydrates with little protein seem to sedate children rather than stimulate their brain to learn. More calcium: The benefits of eating breakfast foods high in calcium (e.g., dairy products) are enhanced behavior and learning. Less stress: Morning stress increases the levels of stress hormones in the bloodstream. This can affect behavior and learning in two ways. First, stress hormones themselves can bother the brain. Secondly, stress hormones such as cortisol increase carbohydrate craving throughout the day. The food choices that result may affect behavior and learning in children who are sensitive to the ups and downs of blood sugar levels. Try to send your child off to school with a calm attitude, as well as a good breakfast. More attentive: Breakfast skippers are more likely to be inattentive, sluggish, and make lower grades. Crave healthy foods: Breakfast skippers are more likely to show erratic eating patterns throughout the day, eat less nutritious foods, and give into junk-food cravings. They may crave a mid- morning sugar fix because they can’t make it all the way to lunchtime on an empty fuel tank. Sets good habits: The benefits of eating breakfast are that it sets the pattern for nutritious eating throughout the rest of the day. When children miss breakfast to save time or to cut calories, they set themselves up for erratic binging and possibly overeating the rest of the day. The benefits of eating breakfast can help your child lead a healthy lifestyle, and you have the power to enforce this healthy practice! For more information on the benefits of eating breakfast and some brain stimulating breakfast recipes check out the links below!